Height: 34 in. (86.5 cm.) – Dimensions of Top, Length: 80.75 in. (205 cm. ), Depth: 24.75 in. (63 cm. ), Circa 1580-1735. A library or painting table with a similar design of openwork carving in the lingzhi fungus relief motif can be seen in The Nelson-Atkins Museum of Art, Kansas City. 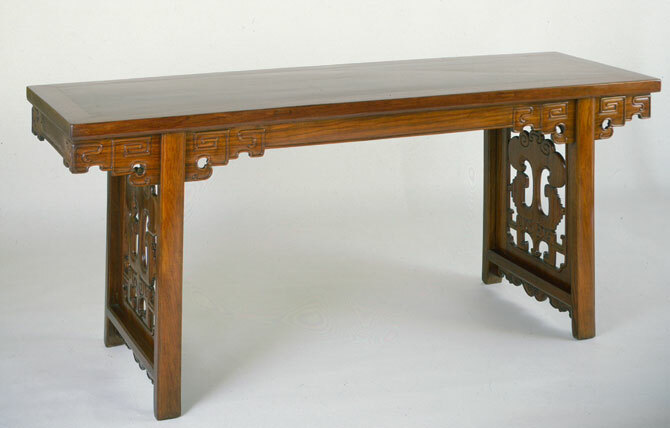 A superb description of this Painting Table can be found on pages 155 to 158 of Dr. Sarah Handler’s Ming Furniture In The Light of Chinese Architecture: “Painting tables, or hua’an, like many side tables, sometimes have side panels with openwork carving. However, they are wider to accommodate large pieces of silk or paper. In traditional Chinese society, all educated men and women had some proficiency in the arts of painting and calligraphy. Ink was brushed onto silk or paper laid flat upon a table and since the brush was held in a more or less upright position and moved by an unsupported arm, it was often advantageous to stand and move about. Thus, the ideal work surface was a large, flat table unencumbered by drawers. The top of this stately painting table has an exceptionally wide floating panel of high quality huanghuali wood with a pronounced grain and deep golden color. The aprons, consisting of a single board running the length of the table, have wide flat beading turning into angular spirals and distinctive hooked patterns. The carving, a combination of angular and smooth curves, has a bold simplicity in keeping with the size and proportions of the piece. These qualities are repeated in the openwork side panels, each dominated by a splendid lingzhi fungus of immortality with a slightly convex surface. The fungus is unusual in the decoration of its upturned end and the base on which it stands. The special nature of this design suggests a regional or personal style. A surety of line, great technical mastery, and superb wood make this a most striking table.